Anna Famery is the host of The Engaging Brand podcast. Her podcast has been nominated six years running for the Best Business podcast. The show interviews a wide range of people and highlights creative ideas of how to develop both a business and the person behind it. 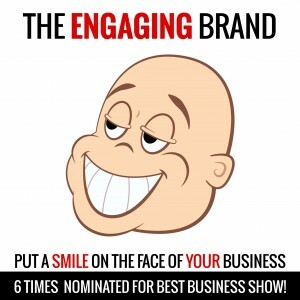 The Engaging Brand strives to bring energy into business podcasting (a genre that can sometimes be boring). I started in 2006, so a few years ago now and I have never regretted it despite the late nights editing! a) I have learned a lot about myself and it has acted as a wonderful self learning experience. Podcasting has taught me the art of listening, the art of curiosity and the need to follow the story rather than a script. b) I didn’t start my podcast for my business yet the podcast brings in 80% of my sales leads. c) The value of being independent. Yes, it is harder now to stand out from the big networks but if you remain consistent and constant to your values then your audience will become your greatest marketing tool. Curiousity! I was given an iPod for Christmas and wondered what on earth a podcast was……when I realised I just had to try producing one. The power of the ear bud hit me immediately. Podcasting has amazing power – it allows you to connect on a one to one basis to people all around the world at a time suitable for them. Powerful. What sorts of topics do you cover on The Engaging Brand Podcast? Who is your target audience? My dad was a huge mentor for me. A self made man he believed in giving back to the next generation and opening up people’s minds to different ideas. So in general terms I discuss business but from different angles. I interview artists, thinkers, business leaders to get the audience thinking about what they should be thinking about…..too often people don’t take the time to learn from others areas and I wanted to create interviews to inspire people to think differently. Business shows can be boring and The Engaging Brand was about bringing some energy into this sector. What words of wisdom do you have for women who are thinking about starting their own podcast? Yes, plan what you want to do, why you want to do it, how you will achieve it and therefore what it will be like…but don’t overthink it. Podcasting is easy, fun and connects you to an audience in such a personal way. As women we can struggle with self confidence, but podcasting for me has actually built my confidence…once I got out of my own way!